Better than finding a twenty in your coat pocket! So I’m reading. Cold War science fiction, of course. I’m flipping pages, flipping pages, carefully, of course, because these are pulps and the paper was fragile in 1953, for god’s sake, and then WHAT? WHAT! Top left corner! An authentic, honest-to-god Isaac Asimov signature! From Amazing Stories, August 1965. 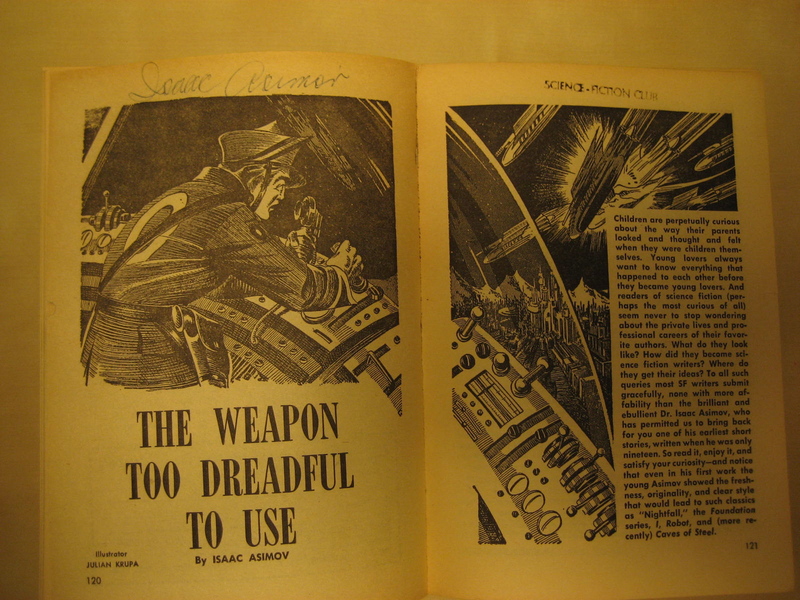 The story was first published in 1939. A flurry of excited emails ensued. This must have been when Asimov visited the UMass-Amherst campus in 1966 at the behest of the UMass Science Fiction Society and the Distinguished Visitor’s Program. He visited once more, in the ’70s; a remastered version of his speech is playable in my Uncertain Futures exhibit.